It seems that the benefits of being a prime member now extend offline as well. It should be obvious to everyone now that Amazon really wants you to sign up for Prime. Really badly. 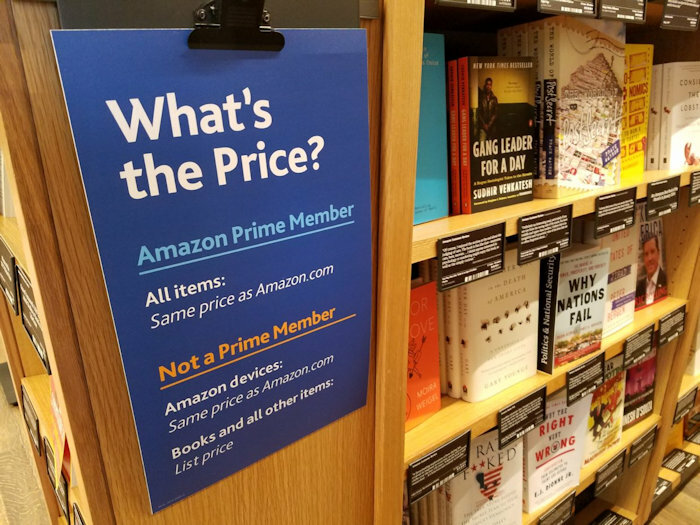 The company has adopted a unique pricing model inside its physical bookstores. There is one price for Prime members, and another for regular customers. Subscribers get the same amount shown on Amazon’s website, while everyone else has to pay the normal, usually higher, list price in store. The system has been in place since August, according to one store clerk, but this is the first time that most of us are hearing about it. If you want deals in their physical stores, you gotta have a prime membership. As you might imagine, much of the company’s revenue comes from Prime subscriptions. You can pay on a yearly basis or subscribe month-to-month. Either way, it is a large chunk of change for most of us. These bookstores in Seattle, Portland and San Diego, soon to be in Chicago and Boston, are great places to sell Prime to the public. Makes sense. Amazon will get many more subscribers now. What do you think? Do you mind this in physical stores?